Well I would be an idiot if I didn’t post some kind of green drink for St. Patrick’s Day, so here’s a little Mojito variation to quench your thirst. 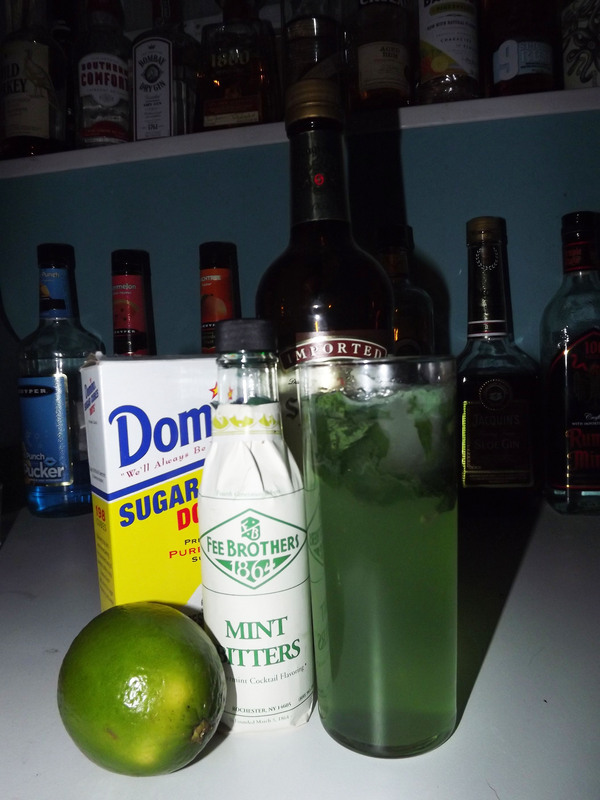 The Green Whiskey Mojito works with any kind of whiskey, but if you really want to be festive get some Irish Whiskey. In my stock I’ve only got Canadian so it will have to do. Just like a regular Mojito it’s got a strong minty and lime core flavor with a bubbly start to the palette. The biggest taste difference is that where you would be looking for a sweet undertone you get a more complex whiskey finish. The mint bitters I added here (mostly for color) round out the sweet to a slightly more bitter aftertaste. Even if you’re not Irish, I bet you’ll enjoy this! Muddle bitters, sugar cubes, lime juice, and mint together in the bottom of a Collins glass. Add ice and Whiskey. Top with club soda. Stir gently until remaining sugar is dissolved. For today’s blended cocktail I decided to combine 2 recipes and make something of a variation and a hybrid (Mojito and Raspberry Daiquiri). Depending on who you are you might find the top of the drink appealing or revolting. The blended mint creates a mossy top for the drink which isn’t the most visually pleasant thing out there, but it does give you a nice minty aroma to the start of the drink. 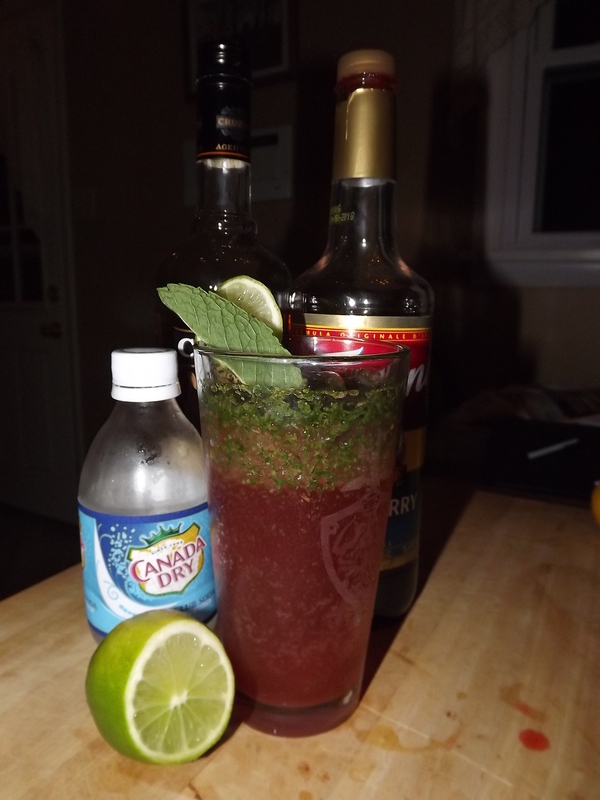 The drink starts with a sweet and icy raspberry flavor, it moves the a refreshing lime and rum, then finishes with a bit of mint. 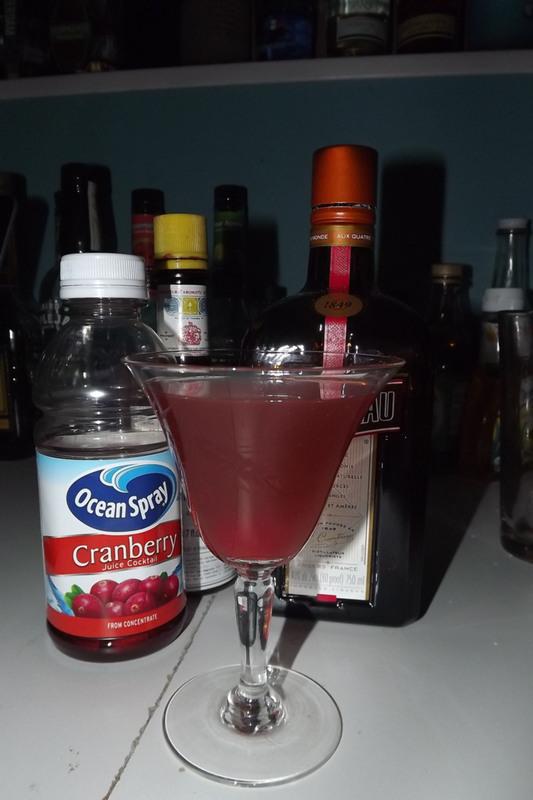 I’m not sure if I can actually call this an original cocktail, but it certainly is a great hybrid recipe that I highly recommend. Blend all (but the club soda) with a cup of ice. Pour into a large pint glass, top with club soda and garnish with a lime slice and a mint leaf. Note: Use raspberry syrup not actual raspberries unless you want seeds in your drink. Did I really think I’d be wearing shorts in April? Nope, but in case where you live it didn’t get unseasonably warm this weekend, here’s a tropical themed delight to at least fool your brain that you’re on the beach. 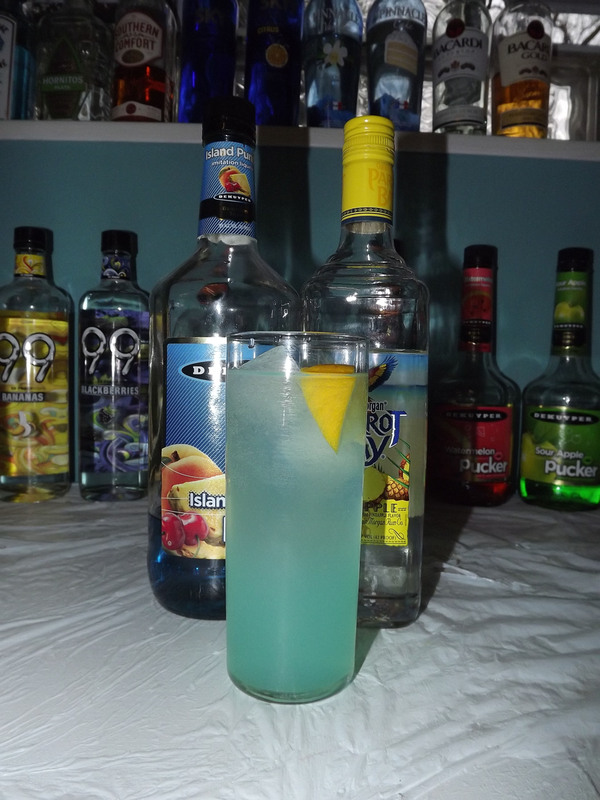 Pedro’s Blue Island is a drink I’ve built based on the traditional Pedro Collins. With a light lemony upper drink (similar to lemonade) and a smoother tropical end toward the bottom, this one is worth making even if it’s not terrible warm out. This drink features my new favorite ingredient (pineapple rum) and my old one (Dekuyper’s Island Punch Pucker). 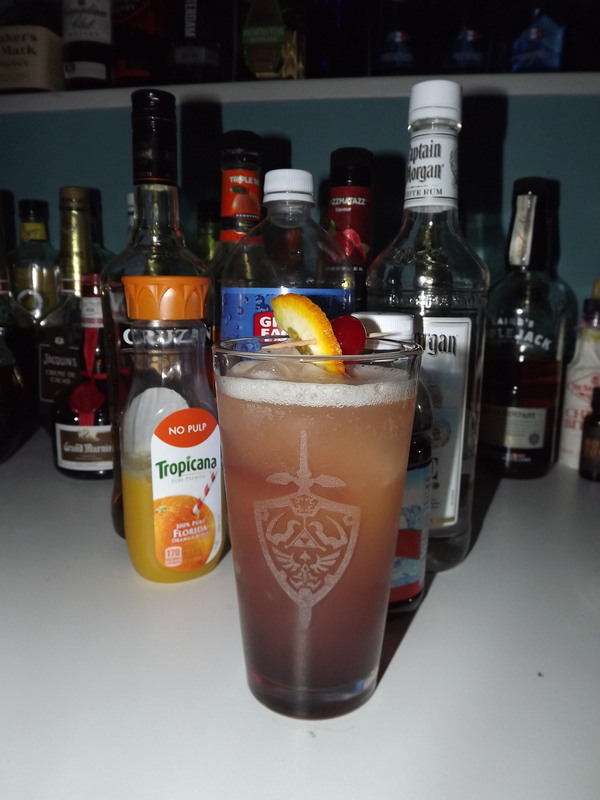 Straight build sweet/sour, rum, and pucker in an iced Collins Glass, stir, add club soda. Garnish with lemon wedge. So this is my new blog, hopefully to be updated every Monday. My goal if any is to have this site be a record of my diving head first into the partially unknown territory of Mixology. The fine art of shaking making and creating cocktails and mixers. As a visual fine artist I find myself perusing greatness in every new hobby I encounter and this one is no different. Much like Mitch Hutts (Geek and Sundry Vlogger and creator of thedrunkenmoogle.com) I found myself turning 21 with very little knowledge of alcohol. but the desire to know more. In recent months to fulfill my 2013 New Year’s Resolution (yep I actually remembered and am working on it) I learned to make a traditional Mojito. From the mojito I moved to a daiquiri and a few other basic drinks, but of course this was just enough to get my feet wet from a shaker. Currently I’m in the process of gathering ingredients for my bar and looking up new cocktails for my menu. Hopefully by the time the annual family Christmas Party rolls around I’ll be able to offer a diverse set of drink for our guests. Add all ingredients together with ice an a shaker. 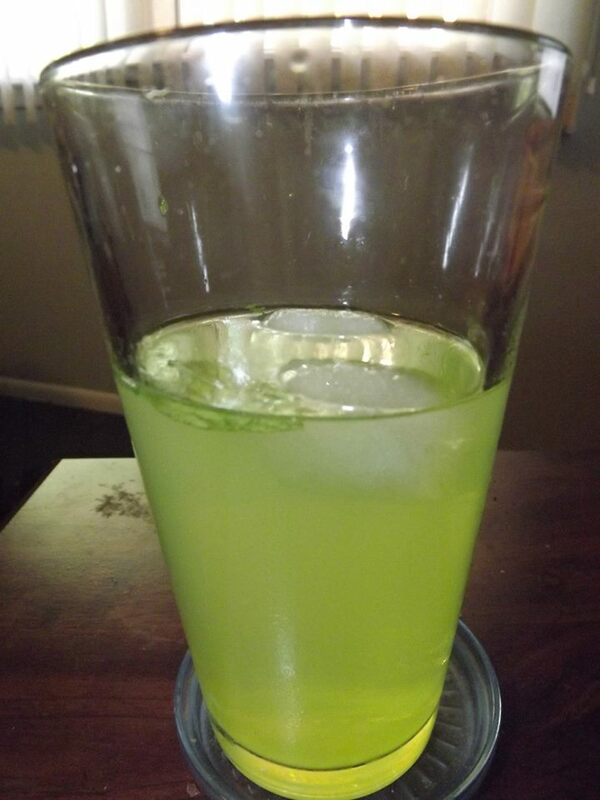 Strain into a highball glass, top with club soda. Garnish with a mint leaf.